Is Kosovo the New European Hotbed of Jihadi Extremism? Not really, despite breathless media claims. Interviews with fighters returned from Syria reveal a more complex picture. Kosovo is tiny, smaller than Connecticut, home to 1.8 million people, over 90 percent of whom are ethnically Albanian, and over 95 percent are Muslim. European in location and feel, the Islam is hard to spot, apart from the five calls to prayer punctuating the day. There are a few hijabs around, but far fewer than in London or New York, and when I pointed one out to my host she gently told me that the old woman was not Muslim but Roma, of which there are many. Knowledge of Islam is perfunctory; secularity a matter of pride. But this tiny, secular country has sent over 300 young men to Syria to fight, and many of those ended up fighting for ISIS. Why? A recent article in The New York Times put a spotlight on the problem, describing in great depth the process of what writer Carlotta Gall calls the country’s “stunning turnabout,” from being one of the “most pro-American Muslim societies in the world” to showing how “Saudi money and influence have transformed this once-tolerant Muslim society at the hem of Europe into a font of Islamic extremism and a pipeline for jihadists.” Never mind the fact that a hem would suggest an edge, although Kosovo is firmly in the middle of Europe, or that the most recent Gallup US-Global Leadership Report of 2016 showed that Kosovo remains the number-one supporter of America in the world (at 85 percent approval; there was actually an increase between 2014 and 2015, the opposite of Gall’s “turnaround”), or that the police deny absolutely the cultural destruction and attacks on journalists, academics, and politicians that she reports. (The single incident they dug out was a piece of graffiti on a wall of Decan Monastery, reading “Kosovo is ISIS.” The perpetrator has not been found.) More serious than the weakness of fact-checking at the Times is that the article’s main point—Saudi interference has transformed a secular society into a dangerously extremist one in 17 years—is unbalanced to the point of misrepresentation. Or was the secularity I perceived merely a veneer, hiding the smoking caldron of jihadism that Gall portrays? The fierce reaction from Kosovars and Balkan academics would suggest not, although there is open acknowledgment from government officials of Saudi influence on the country. Indeed, at first glance the article seems to reflect the government’s own narrative, but distorted beyond all recognition, blaming the aid work of charities from the Persian Gulf. After the war in 1999, charities and NGOs flooded the tiny territory, which was soon to claim independence from Serbia, bringing necessary reconstruction funds and humanitarian aid. Schools were built, food was distributed, services established. But some of this money came with strings attached and an undercurrent that was not immediately recognized: The aid from certain Gulf countries, especially Saudi Arabia, was supplied with a hefty dose of religion. Mosques were built anew, rather than on the bombed foundations of the traditional buildings, and materials for religious education and practice were supplied for free, from the imams to the Qur’ans. Free dormitories were provided for the university in the capital, Pristina, but students housed there were encouraged to attend prayers and study groups in their spare time. “You are Muslim, yes? You should know your religion better,” was the type of encouragement reported to me: The ideology was not forced, but pervasive, putting down roots that, according to Gall and government officials, would for some flower in jihad, with the conflict in Syria and the competing Islamist groups there providing abundant opportunities to wage it. This is not the only post-conflict society that Saudi Arabia has moved into with its money and ideology. This is not the only post-conflict society that Saudi Arabia has moved into with its money and ideology. “Gall’s piece strikingly reminded me of Iraqi Kurdistan after 1991,” my Iraqi colleague Hoshang Waziri said, referring to the establishment of the no-fly zone limiting Saddam Hussein’s actions against the Kurds and granting de facto independence, “where the Saudi charity organizations and radical Wahhabi preaching flourished,” producing Salafist commitments, sometimes with violent elements, similar to the ones Gall reports in Kosovo. “Editors are thinking about the foreign-policy agenda of their own country, and this article was about Saudi Arabia more than anything else,” said Milan Radonjik, a journalist based in Belgrade, a view echoed by many I spoke to in Kosovo. Many pointed out that Gall even missed the other extremist elements, such as the training of young Kosovars in Salafi mosques in Egypt, in her eagerness to blame Saudi Arabia. It’s a popular position to take, partly because it is such an easy target: Saudi Arabia has indeed funded fundamentalist, Wahhabi programs all over the world, has one of the worst human rights records in the world, and those problems are not being addressed by oil-dependent Western governments, whose economies are boosted by arms sales to the country. Li concluded that “most of what has been written about ‘Islamic extremism’ in the Balkans isn’t journalism, it’s conspiracy theory.” His argument as to why these narratives abound is depressingly familiar from other examples of lazy Orientalist thinking, whereby the analysis of the Gulf influence says more about journalists’ preconceptions than the situation they purport to analyze, with their lower standards of fact and analysis reflecting the selectivity of their focus. Li points to the democratic programs that the United States runs around the world that in theory could have led to a handful of young people traveling to fight oppression, in this case, the Syrian regime of Bashar al-Assad (especially given that the United States has repeatedly condemned Assad), but this would be labeled an anomaly, a bug in the system, an example of unintended consequences. But if some graduates of the Saudi programs—which in fact have an ambivalent, if not downright antagonistic, attitude to waging jihad (Saudi education stresses obedience to your leader; and texts used in their courses discourage jihadi action if the government does not approve)—turn to extremist jihadism, the ideology is seen as the driving force, jihad an inexorable outcome. There are yet more reasons to dismiss Gall’s piece. For without an exploration of the other drivers; without examining why so many fighters have returned; without accounting for the dates of their travel or their time spent in Syria; without mentioning that unemployment in Kosovo is around 45 percent, with youth unemployment at 70 percent; without reporting that there has not been one case of travel or attempted travel in the past eight months; without an exploration of the social networks of friends and relations through which ideas spread most easily; and without talking to the people who have actually traveled and returned—there can only emerge a picture of the country heavily skewed toward extremism, and a heavily simplified account of human nature and motivations. Asking returning fighters reveals a mainstream, even laudable, cause: to defend the victims of Assad’s oppression. A fact inconveniently incompatible with Gall’s story is that 30-40 percent of the total number of Kosovars who went to fight in Syria did so in 2012, and a further 20 percent in 2013, before the emergence of ISIS, and they often returned after just a few weeks. This was hardly fighting for a jihadist, Saudi-sponsored cause, so what explains it? 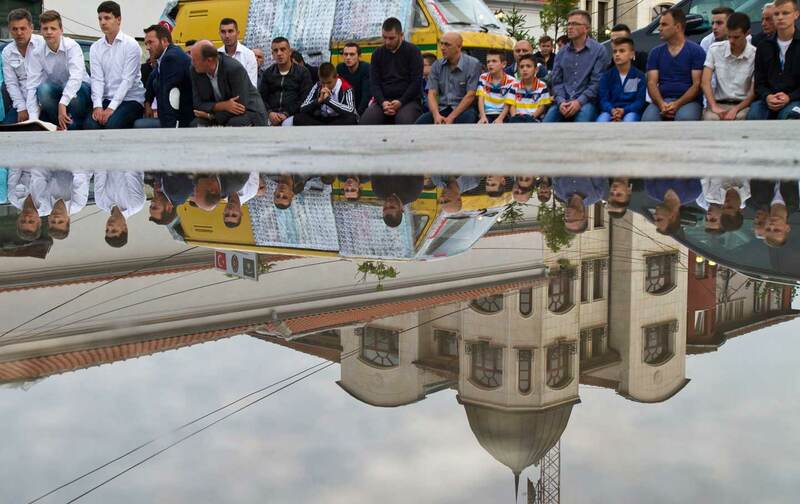 Asking the returning fighters, as researchers and the government in Kosovo have done, reveals an idealistic cause that seemed to the young people at the time to be a mainstream, even laudable, position to take: to defend the victims of Assad’s oppression. In May 2012, Kosovo’s then–Foreign Minister Enver Hoxhaj declared support for the Syrian rebels, condemned Assad, and later, in a strongly argued piece in Foreign Policy, called for international military intervention, with the example of NATO intervention in Kosovo in 1999 as a model. At this point, the European Union and many Western governments (including the United States) were expressing the same criticisms of Assad, and many of those traveling to Syria at this point did not imagine fighting there to be a crime but rather something noble. Of course, there were other motivations, especially at different points of the conflict, and interviews with just two young Kosovars show the range and complexity of motivations in leaving Kosovo, going to Syria, and returning home. On opposite ends of a spectrum, from one who is clearly loyal to the Islamic State and proud of his time spent with it, to the other, who was bewildered and demoralized by the experience of watching rival opposition groups fight when he thought everyone was there to defeat the Assad regime, these two Kosovars shine a light onto the different motivations even within a small and relatively homogeneous society. These differences complicate the picture that Gall and others have produced. Without actually asking those people who did go to fight, there is no way of checking the grand geopolitical and ideological narratives, and no way of establishing the differences—and similarities—among all the approximately 90 countries that have seen citizens traveling to Syria and Iraq. Well, exactly. This prisoner was no angel, and his narcissism in the end let him down, showing that he himself was dissembling in the hope that we would fall for it and his innocence would be established. It was soon clear that we were not to question his commitment to Salafi, extremist Islam. He wouldn’t meet my eyes and wouldn’t shake my hand, an experience never to be repeated in Kosovo, not even with the highest imams in the country. And it slowly emerged that there was no question of his allegiance to the Islamic State, either. What danger that might pose to his country of birth, though, is far less easy to discern, as commitment to one cause does not necessarily imply violence against another. Humans, for better or worse, are more complicated than this. Before beginning my own interview with Kushtim I observed a team consulting him on possible approaches to reintegrating returning foreign fighters into society. I watched him slowly unwind, almost seeing the thought on his face, I’ve got these ones in the palm of my hand. The eye twitch subsided, he sat more comfortably in his chair, his hands stopped rolling the documents quite so manically. So when the room emptied and I was left with just him and an interpreter he was relaxed and smiling. I launched straight into the psychology experiment that I have performed with fighters all over the world, using flashcards so removed from people’s normal experiences in interviews that they are drawn out of themselves, whatever self they are trying to project, in the effort to understand this very new (and sometimes odd) task. I begin with a card showing five almost-naked men, ranging from a slight, boy-like figure to the biggest bodybuilder imaginable, with three sizes in between. Instead of heads, these men have flags, in this case the Stars and Stripes. “This is the American army,” I begin. “How strong do you think they are, physically—that is, with their weapons, their technology, logistics, supplies—everything material. Here is weak, here is very strong, the strongest imaginable. Which one represents America’s army the best?” He points to the strongest, predictable in his desire to please, to distance himself from ISIS. I ask about their spiritual strength and he denies direct knowledge. So I ask about his friends who are still fighting in the Islamic State, “How do you think they would answer?” The answer is telling. “Those who face them in the battlefield say A [the weakest], because we are braver, much braver.” Within a couple of minutes he has lapsed into “we” without noticing, with no cover-up; indeed, the opposite—there is pride in his membership of ISIS. From the pride and narcissism of this young prisoner, an indomitable image of the Islamic State emerges, one that is at odds with the pronouncements of Western politicians and Western media. There is no stopping them, he told me, happily. No one can match ISIS soldiers for commitment in battle, but they also have the necessary techniques and strategy, using the extensive expertise coming from previous jihadi conflicts in Chechnya, Afghanistan, Iraq, Libya, and Yemen. Kushtim described in great detail, and with great mirth, how they had outwitted an American mission, a 26-missile airstrike, by evacuating civilians, burying the heavy weapons in the desert sand, and hiding in pre-prepared caves. Not one person died, he told us, and no weapons were lost. “Just some damage was done to buildings, that’s all,” he said, smiling and shaking his head, no doubt in wonder at the idiocy of the Americans, to think that they could beat ISIS. It would be nice to dismiss this as a result of his pride in the group, not rooted in reality, but unfortunately it resonates with testimonies of those facing ISIS on the frontline. Many of the Kurdish peshmerga and soldiers in the Iraqi army speak with grudging respect about ISIS fighters they are facing on a regular basis. No one I met denied the commitment of the fighters (although it wasn’t always attributed to commitment to the ideology; some mentioned drugs, or fear for their families, or the spoils of war such as money or women). Some veterans go as far as to say that ISIS is the most formidable enemy they have ever faced, including Saddam’s army and Iran. Many say that the coalition might defeat them in the short term, at great expense, but the group is capable of fighting the long fight, and they have the quality of soldiers to do so. I’m glad I didn’t see this before the interview: There are numerous images of Kushtim posing proudly with guns and ISIS flags, wearing military fatigues and an ISIS-style black bandana, standing at the front line or by tanks or in barracks, including from his very own Facebook page, alongside declarations of allegiance to the Islamic State. Of course, social media can be hacked, and the excuses as to the photos are easy (“they terrorized me”), but the sheer amount of these photos, the clear pride, the macho happiness in the poses with the guns and the flag, are sickening. Kushtim had told me he was on Facebook constantly while he was in Syria; indeed, the only breaks he had were for sleeping and praying, he said, and he further volunteered that he was only posting about Syria, not Kosovo, as his mind was fully on Syria at the time. That is, the bragging was constant. There are plenty of cases of people terrorized into participating with ISIS propaganda: The videos with captured British journalist John Cantlie show deep unease and fear in his role, haunting the back of his eyes. This young Kosovar shows only pride. The policeman is clear: The young man is dangerous, and needs to be punished rather than rewarded. The fact that he threatened to return to the Islamic State if he wasn’t treated well by the government was called in on both sides of the debate: “we should treat him properly”; “no, this is evidence that he will use any excuse to go there and take more with him.” This debate is being held in every country that has seen young people go to Syria and return: Lock them up forever (in some countries this reasoning extends to the death penalty) versus care for them and integrate them back into the society they have rejected. Researcher Skender Perteshi, from the Kosovar Center for Security Studies, goes further: “Prison is not the answer for CVE. These fighters thought they were doing right. They are not wrong, or guilty. They are not terrorists—they returned. Putting them in prison or under house arrest will only increase radicalization.” He was quick to add that he was not talking about the recruiters or organizers, who he believes are much more dangerous to the country, but rather those who have been duped into breaking the law, vulnerable individuals whose good impulses were taken advantage of. With a law criminalizing fighting for a foreign armed group or police, some returning fighters can and do end up in prison, but reintegration is not off the list—merely delayed. Not many countries have the legal scope to put people away forever in this situation, even if it was desired. Besnik’s information was coming from mainstream media, soon reinforced by material flooding over social media. “I saw these crimes for myself, on YouTube,” he said, often via friends on Facebook and Twitter. He did not know, he claimed, that some of those videos were carefully crafted recruiting material for Islamist groups, which stressed the sectarian nature of the crimes rather than reporting them as straightforward war crimes from a dictator bent on suppressing opposition. These recruiters follow up with those who watch their material, reaching out individually, adapting the message and tone as necessary to encourage further commitment. They pave the way for people to get to Syria, giving advice and sometimes even money for the journey. The only time Besnik stumbled in his narrative was his account of his own journey. He said he paid at Pristina airport for his own ticket to Hatay, a Turkish town close to the border with Syria and a common way station for travelers heading there, whether for fighting, humanitarian work, activism, or journalism purposes. At the ticket desk he overheard someone booking exactly the same ticket, so Besnik traveled with him, even though he’d never met him before, he claimed. It was only when they reached Hatay that they confessed to each other they were both going on to Syria. Apart from being extremely unlikely in itself, there were warning signs as to this story’s veracity from Besnik’s stammers and corrections, and his eyes were more shifty than during the rest of our conversation. He repeatedly denied knowledge of the whereabouts of this man now, leading me to suspect he was trying to protect him. For the whole five weeks that Besnik was in Syria, he was entirely reliant on this man’s knowledge of English, as they were fighting in a group, 100-strong, which had no other Albanian speaker. This last point was surprising. I pointed out that an army doesn’t function well if orders cannot be understood, and it’s not good for camaraderie and morale. Besnik agreed, though he said he didn’t get to the point of any real fighting anyway, but yes, the lack of a common language made it a lonely experience: “I got bored of always talking in body language,” he said, an indication that the primary motivator for any extreme action, sacrifice for a group identity, was absent. Kushtim’s phrase, “We had our faith, we were all together,” was the opposite of Besnik’s experience. When clashes began between opposition groups, Besnik was not well enough fused with his own (although he was sure he was fighting for the opposition, he didn’t know which group he was with, he claimed) to pick up a gun against another: He was there to fight the Syrian regime, not other resistance groups, so he decided to leave. This was well before ISIS existed, and he did not have a problem getting his passport back and returning to Kosovo. What he was not expecting was the response from the authorities back home. Besnik’s village is in the Hani i Elezit municipality, an area that has seen a disproportionate number of young men travel to Syria. While waiting for the interview, I sat in a cafe with the mayor, Rufki Suma, a remarkably serene and hospitable man, the only independent mayor in Kosovo and, even more telling, a mayor who did not run an election campaign. His reputation (both as a fighter in the Kosovo Liberation Army and as a religious man), past performance (he is in the office at 6 am every day), and sheer force of personality ensured his election. We have coffee in the sun, Suma greeting every other person coming down the street. It seems like a rural paradise: pretty houses, lots of blossom, cobbled streets, children playing, people gossiping. I ask what makes people go from such a beautiful town to an unknown place with an unknown language to risk their lives, with joy. Suma has of course had to think about this a great deal, and is proud that the work of the municipality has dried the flood of fighters completely—though it is not possible to relax. The problems driving the exodus largely remain, Suma believes, citing the lack of jobs and training opportunities, and a stagnant economy with stalled building works littering the area, as the major factors that need to be urgently addressed. Driving a returning fighter away from a Kosovo identity is the opposite of the Aarhus model, which seeks to encourage all Danes back to a sense of nationality and social acceptance. Perhaps the new reintegration program currently being developed in Kosovo will address Besnik’s case, which seems fairly straightforward—he does not pose a threat to his country, despite his disillusionment, as he is still worlds apart from the profile needed to sacrifice his life and that of others for the sake of an extremist Islam. Kushtim, on the other hand, seems raring to go, to be given any chance to show his bravery, strength, and beliefs, an example of what has been called the “Islamization of radicalism” by French researcher Olivier Roy. The government now has to choose the future for both of them. A deep faith in human nature would mean reintegration into society for all. Fear of terrorism would say prison or house arrest instead. I left the country feeling sorry for one prisoner and fearful of the other. Any nationwide program will have to take account of both, and this is the challenge facing countries around the world that have seen citizens travel to Syria and Iraq to fight. Lydia WilsonTwitterLydia Wilson is a research fellow at the Centre for the Resolution of Intractable Conflict, University of Oxford; a visiting fellow at the Ralph Bunche Institute for International Studies at the Graduate Center, City University New York; and a senior research fellow and field director at Artis International. She edits the Cambridge Literary Review.